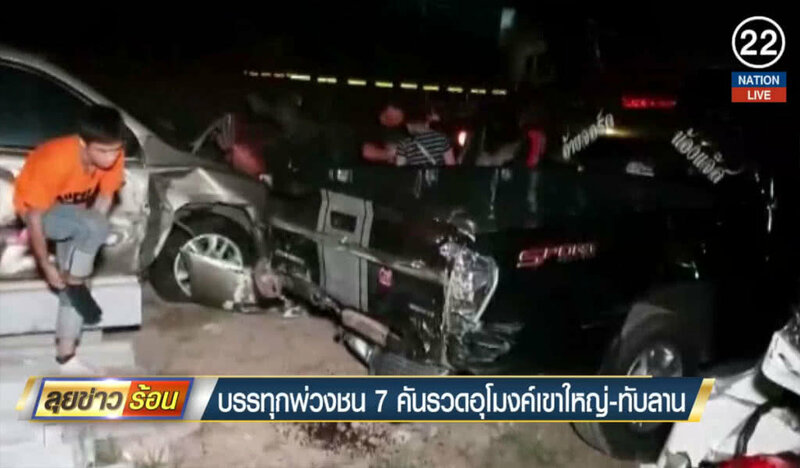 More than 10 people were injured when a trailer truck lost control and hit six other vehicles in Prachin Buri's Na Dee district late Monday night. Police said the accident happened at about 11.30pm on highway No 304 in Ban Thap Lan village in Tambon Bu Pram. The spot where the accident occurred was near the tunnel built to allow wild animals to safely cross the road, that runs between Khao Yai and Thap Lan national parks. Police said the trailer truck driven by Pornchai Arpornkaew, 35, hit a van, a car, a ten-wheel truck and three pickups that were slowing down before entering the tunnel. The trailer driver and drivers and passengers of the six other vehicles were injured. Police said Pornchai was hauling sugar from Nakhon Ratchasima to the Laem Chabang deep seaport in Chon Buri when he found that he could not apply the brakes. when he found that he could not apply the brakes. Yawn... Come on, its time to change the record, the needle is stuck again. "Police said the accident happened at about 11.30pm on highway No 304 in Ban Thap Lan village in Tambon B u P ram. " This was not a so called accident, the truck driver crashed into cars. At least the wild animals are safe there. Correct. Unless this was the truck drivers first day at work, he should know to keep some extra distance to vehichles in front of him. One day, the age of most trucks driven on these roads might be less than 40 years old. Most of them are total relics..